On the news today, 20 km north of my birthplace, Chatham, ON, someone or a group of people posted a sign about God forbidding abortions and homosexuality. Someone else or a group of people took the sign down as it is now reported gone. This type of thing was a key driving force in my decision to study the Bible on my own because I could not understand why Christians could be so hypocritical, disrespectful, mean, and downright vicious. The Bible story of the woman caught committing adultery comes to mind. She is brought to Jesus by a crowd of men who tell Jesus the punishment for an adulterous is stoning. Jesus pauses, bends down, writes in the dirt, and then replies with whomever has not sinned (done things God doesn’t like,but forgives with his merciful love), let him cast the first stone. Jesus then asks the woman if anyone remained and she replies no. Jesus then says who is he to judge either, but to go and sin no more. The Bible contains a lot of do’s and don’ts, but taken out of context or extracted to justify one’s disrespect to another, means we don’t get the big picture … Jesus died to give us peace and God loves us unconditionally so we can learn to do the same for others. Anything less is not what God asks of us all. This is just a sampling of the positive rewards to be reaped by adopting the idea everyone is valuable … to be respected simply for being a life … because each person has a unique contribution to share with the world once they are encouraged, educated, and empowered to fulfill their potential to the best of their ability. 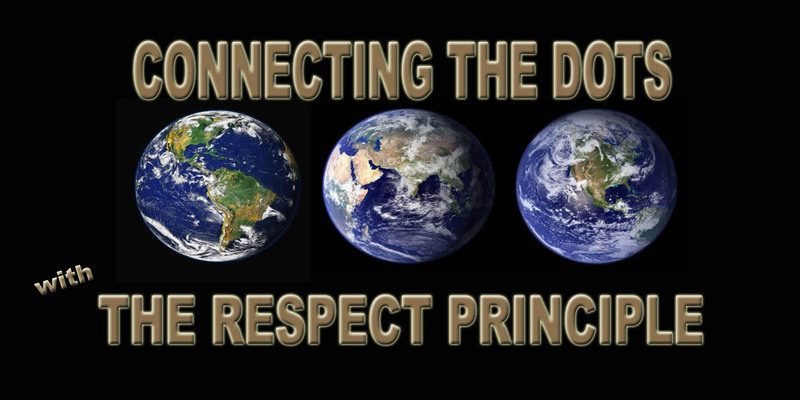 Learn more about Connecting The Dots With The Respect Principle by reading the different books or booking a presentation for your school, community, or organization. Thank you for your interest and support in making the world a better place for everyone! Crazy people don’t know their idea sounds crazy … but many great ideas do sound crazy initially … telephones … televisions … automobiles … airplanes … world-wide web … like mine, Connecting The Dots With The Respect Principle, does, but as with these listed and many others, in time respect as a global principle, rather than a discretionary value chosen by a person or a group of people, will be recognized as the most logical, practical, and compassionate means, other than love, to co-create a better world for all. Below Charles Schulz’s “Charlie Brown” expresses his opinion.